Now and again a book we’ve all been waiting for comes along, and this is one of those books. This book introduces readers to the concept of research literacy, which involves the ability to judiciously use, apply, and develop research concepts and tools as a fundamental part of one’s teaching. To be research literate, one needs to develop the skills to draw on, critically scrutinize, and integrate different kinds of evidence. Specifically, the book aims to develop English language teachers into informed and critical users of research tools and by-products. However, making research literacy an integral component of what teachers do in their daily teaching and learning contexts requires making available to teachers the necessary support for conducting research in their own classrooms and sharing their findings in an effective manner. 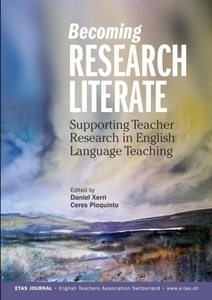 Hence, the book foregrounds not just the importance of providing support but also the kind of support that needs to be provided if research literacy were to succeed as an essential and sustained part of what it means to be a language teaching professional. Edited by two experienced teacher-researchers, this book compiles a broad range of perspectives to demonstrate the potential uses of a research-informed pedagogical framework not just in English language teaching but in the teaching of other languages as well. Thus, by promoting research-integrated professional practice, this book aims to facilitate the professional development of all language teachers. In particular, experienced and novice teachers who want to integrate research in their teaching practice but have no formal training in the research process or experience in conducting research will benefit from the profound insights that inform this book. And for research practitioners and scholars who want to further enhance their professional competencies in the research process, the book includes articles that provide a clear and thought-provoking path through the texts and arguments of this exciting field of teacher research. Aims to diminish knowledge gaps on research in English language classrooms by offering a solid rationale for developing teachers’ research literacy. Addresses the various kinds of support different stakeholders – teachers, teacher trainers, school leaders, and teacher associations – need in order to create a culture of teacher research in their respective contexts and encourage it as a form of life-long learning endeavor among their constituents. Focuses on developing methodological knowledge and analytic skills that may be useful for anyone wishing to learn about conducting research in their classroom and those who consider research knowledge as a way of enhancing their professional competencies.• Serves as a resource on various methods of inquiry for teacher trainers, school leaders, and teacher associations around the world wanting to know more about how to support teacher research in their contexts. Includes contributions written by world-class experts in the field of teacher research who have plenty of experience in supporting classroom practitioners in a wide variety of international and educational contexts. Dr. Daniel Xerri is a Lecturer in TESOL at the University of Malta, and the Chairperson of the ELT Council within the Ministry for Education and Employment in Malta. Dr. Ceres Pioquinto is the Editor-in-Chief of ETAS Journal, English Teachers Association Switzerland. ETAS Journal retains the right to reproduce part or all of this publication in other publications. Individual articles in this publication remain the intellectual property of the authors, to whom permission to reproduce should be made. they may not alter, transform, or build upon this work (https://creativecommons.org/licenses/by-nc-nd/4.0/). Xerri, D., & Pioquinto, C. (Eds.). (2018). Becoming research literate: Supporting teacher research in English language teaching. Sursee, Switzerland: ETAS Journal.